Stacey and Jamie were doing a little baking. (I hope Stacey will bring her baking expertise to the blog one day soon) So, after we indulged in some really great liquor-ladened sweets we were starting to get the munchies for some more substantial eats. 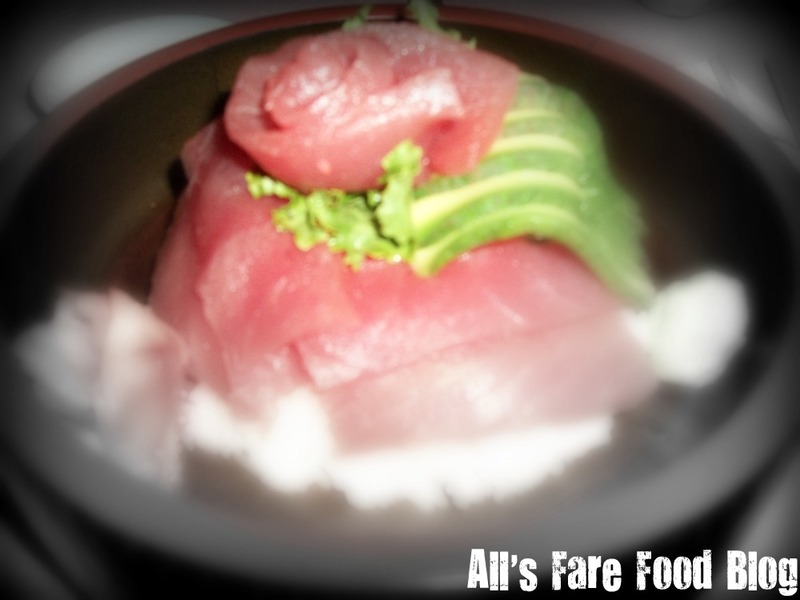 We headed up Route 1 in Saugus, Mass., to a little sushi shack called Sake. Now, I must apologize in advance that I don’t have more pictures of our dining experience. My camera takes really poor pictures in low lighting so it was acting a little wiggy on me this night. But, please take my word that the food was really good! The ambience of the restaurant transports you to Japan. Think lots of wood, bamboo and the waitstaff wearing traditional kimonos. I felt like Mr. Miyagi was going to jump out from behind the sushi chefs. However, I felt it was kinda weird that they had a fish tank (full of live fish – not the kind you would eat – more goldfish and guppies) right next to the sushi chefs artistically hacking up their cousins. While the restaurant had plenty of western-style tables (the standard height table and chairs), we opted to sit on the lower tables with no chairs and on pillows. For me, leaving our shoes and coats near the door was a bit strange. We all thought we had to sit with our legs crossed like pretzels but, surprisingly, there was room under the table where you could comfortably hang your legs down to sit normally. Still, it was hard to get up and down from the table in a graceful manner. The waitstaff was uber-friendly and greeted us with the traditional “irasshaimase,” meaning “please, come in.” They brought us warm wash cloths to freshen up (they smelled like lavender). I still remember when airlines did that back in the day. Oh, how times change. We started off by ordering drinks. I indulged in a really light, sweet plum wine. The plum wine, while really sweet and fruity, hit the spot. I was surprised how easily it went down but it had a little kick to it. Unfortunately, Sake doesn’t have a website (at least one that I could find) with a menu. It wasn’t as expansive as some I have seen in regards to sushi/roll selections. But all the standard staples were there – the California roll, the Philadelphia roll, sweet potato, etc. If you didn’t want to indulge in sushi, you could try something from the kitchen like a cooked Udon noodle dish or teppanyaki dinner. Most meals come with soup (a miso soup – really good) – and a garden salad with a ginger dressing (also, really good). That wasn’t indicated on the menu so when our server brought them out and just laid them on the table, we were a bit confused as to who they belonged to. 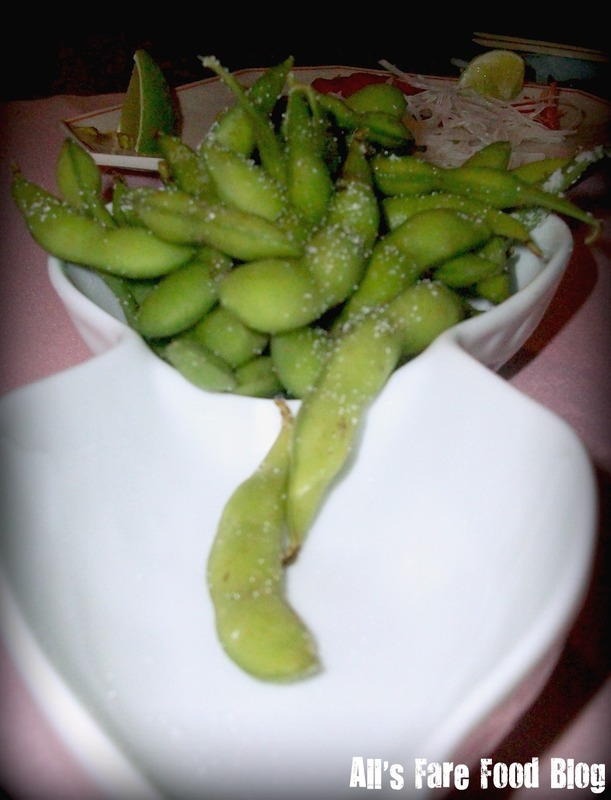 In addition to the soups and salads for apps, we also got two orders of edamame (steamed soy beans in the pod with a little bit of salt). I always find edamame to be so much fun to eat. Sometimes, I like to bring some frozen edamame to work in a plastic container. I put a little water in the bottom and microwave for a few minutes with the cover loosely on. Then, I have a real, quick and easy snack during the day to help tie me over until a later lunch or dinner. Instead of ordering sushi, sashimi or some maki rolls, I decided to go for a more traditional Japanese dinner. So, I ordered the Tekka Don – slices of tuna sashimi over a bed of seasoned rice. It was garnished with a little bit of pickled ginger and sliced avocado. The funniest part of the meal was when Jon and Jake had both ordered meals from the kitchen. Our server left an unlabeled vial of seasoning on our table. When we asked her what it was, she just said it was very spicy, but very good. She then proceeded to start dashing it all over Jon’s meal. We all got around to tasting a little bit of this secret seasoning, man…my eyes were getting watery. This little non-labeled concoction packed a serious punch. I’m not quite sure what was in it but it started off mild and slowly got more intense. The meal ended with everyone getting a few little boxes of strawberry-flavored gum. It tasted good for all of about 30 seconds and then became heinously unbearable. Despite the strange, spicy powder and the wickedly awful gum, I would definitely return to Sake. As kitschy as some of the restaurants on Route 1 are (think the place with the herd of cows outside right across the street) or the large, temple-esque Asian creation a few miles down the road, Sake brings the real food deal and turns its place into a roadside oasis. This entry was posted in Cuisine - Japanese, Places - Boston, Places - New England and tagged Boston, edamame, Emerson College, ginger, Japanese, maki, Massachusetts, miso, plum wine, reviews, Route 1, Sake, salad, sashimi, Saugus, sushi, tekka don, wasabi by Christina. Bookmark the permalink.